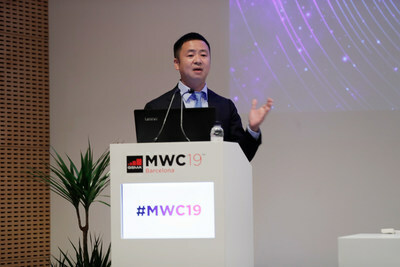 BARCELONA, Spain, March 7, 2019 /PRNewswire/ — At Mobile World Congress (MWC) 2019, Huawei officially released the Optical Networking 2.0 (ON2.0) solution. This solution enables new speed as per Moore’s law of bandwidth to maximize fiber value, new site (simplified sites) to reduce costs, and new smart O&M to evolve towards autonomous driving networks. This solution will continuously reduce O&M costs and enable service innovation. In the 5G era, we are seeing new 2C, 2B, and 2H services emerge constantly, driving the CT industry to a new stage of development as well as posing greater challenges to transport networks: In the 2C field, the revenue of operators is not increasing at the same rate as data usage; in the 2B field, operators’ market share is being eroded by cloud service providers (CSPs); in the 2H field, user experience is not sufficient for supporting the development of emerging services and complex networks increase network O&M costs. Bandwidth needs must be satisfied. However, the bandwidth-driven development model can no longer support the revenue growth of operators and needs to be transformed to experience-driven. Kevin Huang, CMO of Huawei Transmission & Access Network Product Line, said, “We need to streamline optical access and optical transport networks to build a 5G-oriented end-to-end (E2E) optical infrastructure network. This will help operators build integrated optical networks with optimal per-bit cost and assured E2E service quality to cope with the challenges in the 5G era.” Against this backdrop, Huawei releases the ON2.0 solution, which has the following three core values. New Speed: Moore’s Law of bandwidth will drive the E2E technological innovation in access, metro, and backbone networks to continuously improve bandwidth and maximize the value of fibers. In addition, Wi-Fi 6 is used to accelerate home access, Flex-PON2.0 to seamlessly upgrade GPON to 10G PON, Super 200G to improve single-carrier rate, and Super C Band technology to maximize the potential of optical fiber spectrum, achieving Moore’s Law in the optical domain. New Site: Optical networks, including access, metro, and backbone networks, will be simplified in an E2E manner to significantly reduce required equipment room resources. On the access side, unified access over multiple types of media will be implemented to simplify access sites. On the metro side, MS-OTN will be used to carry multiple types of services, simplifying CO sites, streamlining access and transport networks, and achieving one-hop connections. On the backbone side, all-optical cross-connection will be used to build 3D-Mesh backbone networks and simplify fiber connections, achieving all-optical grooming. New Smart O&M: A digital twin will be built on top of the physical optical networks by using AI, big data, and cloud technologies. This transforms O&M from passive to proactive and site configuration from manual to automatic and intelligent, facilitating the evolution towards autonomous driving networks. As for scenarios, such as premium broadband, premium private line, and network health prediction, intelligent technologies will be used to reduce O&M costs and ensure optimal service experience. With the ON2.0 solution, Huawei can help operators achieve “optical network as a service” and transform transport networks from connection-centered to experience-centered, enabling the business success of operators. Currently, Huawei has innovated collaboratively in ON2.0 with operators around the world to support their business growth. Huawei has worked with China Mobile to develop an OTN 4K premium video live broadcast solution to provide superb video experience by building non-blocking and zero-packet-loss pipes. Huawei has collaborated with Fastweb in Italy to incubate a premium private line solution, reducing service provisioning time from months to weeks and providing 99.999% high availability. Huawei has also cooperated with another Europe operator to accelerate the innovation in premium broadband solution, which supports E2E access network topology inference and accurate fault demarcation, reducing onsite visits by 30%.